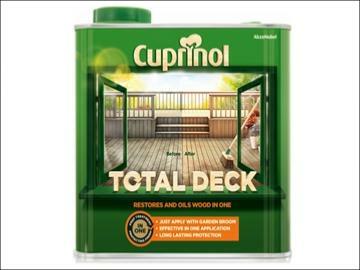 Cuprinol Total Deck offers a natural finish that protects decking all year round. Its unique double action formulation restores and protects grey and weathered wood. Cuprinol Total Deck is easily applied with a garden broom, which can be washed after use and re-used. This innovative new decking solution not only pre treats decking but gives a protective finish. Coverage: 22m² per 2.5 Litres (1 application).